We’re driving from Kansas City to Houston: nearly 800 miles ahead of us, and it’s a bit like driving down Memory Lane, literally, as I’ve made this trip so many times over the past few years, whether going back and forth to college countless times at Wichita State University, or moving to Houston for the first time in a huge moving van packed to the rafters. It’s rather appropriate to be making a sentimental trip now, as it’s time to ring in the New Year, which naturally means a time of reflection, and for this I say, “Bring it on!” I arrived at the end of December feeling quite tired, and it finally dawned on me why: a complete new recital to the start off the year, revivals of the demanding and draining role, Dajanira, four new, extensive (and exhilarating!) roles back to back, with a ‘little’ recording (of nearly all new material!) thrown into the mix, adding in the thrill of a wedding and the agony of a huge personal loss – what a year! Big questions! The answer: because I truly love it and I believe in it. I can’t flip the calendar forward 25 years and say that I’ll always feel this way, but at the conclusion of this year, 2006, I believe it more than ever. This career has showered me with innumerable opportunities: to travel and learn about the world and some of its diverse cultures, to work with brilliant talents and minds, to breathe life into the work of the greatest composers the world has ever known, to grant me the opportunity to explore at a deep level every imaginable emotion (and then some) we humans experience, teaching me at every step along the way, to be able to touch people, and communicate with them, helping open doors to their worlds for a few hours at a time. It’s a bit overwhelming, to tell the truth. This past stay in Paris has been a particularly difficult period for me, but looking back, having the incredible opportunity to sing through so many of the emotions I was dealing with personally, well it’s a lot cheaper than visit to a therapists office on 5th Avenue! The bottom line is that I can look back on 2006 with great joy and gratitude for having experienced and ascertained so many different things, for having met so many wonderful, generous people, and at the end of the day, for having SURVIVED! (A definite personal highlight: eloping with Leonardo! *What a THRILL to sing for the Wigmore audience my one-off recital about Venice, a program I had been dreaming about doing for years, and finally the timing was just perfect to bring it to life. I was quite honored that they recorded it and that its release is being received very well! What a complete joy to sing for the Wigmore Audience! *MY FIRST SESTO! What can I say about this role? My perspective is quite interesting as I just finished a run of Idamante’s in Paris, and it is a role which is honestly at the very bottom of the list of roles I prefer to sing. I do think that Idomeneo is the superior opera, all things considered, but in my opinion the role of Sesto is unsurpassed in Mozart’s offerings for the mezzo. It was a great joy to finally sing the arias I had used numerous times in auditions in the context of the opera, and not surprisingly I found it to be an unparalleled joy to sing. *¡PASIÓN! Three draining, exhausting, adrenalin-filled days recording this disc in the hills of the tiny, provincial Spanish town of Jafra, pushing ourselves amidst the intoxicating rhythms of Monstalvatge, De Falla, and company, and loving every minute of it! With the exception, maybe, of one track, I just adore every single selection on this disc, and having the chance to put my stamp on these pieces was an immense pleasure. 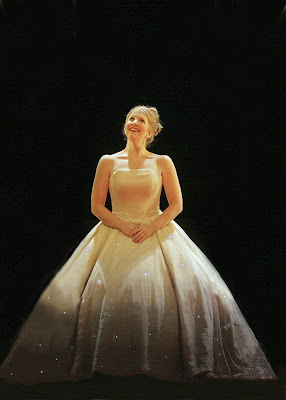 *MY FIRST CENDRILLON! Words are hard to come by to describe the experience of learning this role, and having the privilege of performing it in Laurent Pelly’s dazzling production in the magical setting of Santa Fe with such an outstanding cast, full or heart and soul. It was an enormous challenge for me, as it was my first serious French role, and I had my work cut out for me with not only the vast amounts of French, but also the dramatic vocal turn the role took as it progressed. It stretched me in many ways, and gave me memories to last a lifetime! *MY FIRST COMPOSER! I had real reservations going into this role. I had been consumed with preparing Cendrillon, and the performances took so much of my energy that my preparation for Strauss’s naïve Komponist seemed to be way too slow. I had also been listening to the consummate artist, Tatiana Troyanos, a great deal, and I was thinking, “I just can’t do this role justice. I won’t be ready. I just can’t sing it like her.” (Another reason I’m not a big fan of relying on recordings to learn roles!) I even warned my manager, “Simon, I don’t know about this one…I don’t feel good about it. Maybe you shouldn’t come.” But I buckled down, kept myself at the piano, slowly pouring through it, and working very hard on the German. I arrived for the first rehearsals, and the memory wasn’t coming, the music hadn’t clicked into place for me, and I was feeling very far from the core of the role – something that is quite unusual for me, truth be told. But I kept working…and kept working. And BAM, I arrived one day for rehearsal, and it had clicked. I called it the “Strauss Click” where it just all of a sudden makes perfect sense, and could not possibly be set any other way. It was a beautiful day. And from that point on, I was able to revel in this character, and I completely fell in love with him. I hope I will have more opportunities to sing his anthem to music over the years, but in the meantime, my appetite is more than whetted for the coming Octavian! I’ve worked with extraordinary colleagues in these productions, (as well with a few challenging ones), but over all, they have inspired me, pushed me, motivated and supported me, and as always, I have learned so much from them all. We’ve shared delicious meals, stimulating conversations, a few fabulous cocktails, and many great jokes. There has been personal tragedy along the way for many of us, and this remarkable family, spread out over many countries, time zones and languages, always pulls together and lets you know you are not alone. *I return to my well-worn roles of Cenerentola and Rosina, but this time in high-profile AMERICAN venues, and I want to sing these roles better than I ever have, in more idiomatic Italian, with more fire and brilliance in the phrasing, and with ever more truthful characterization. *I take on my second major recital tour in a program I ADORE, and I want to devour it with great passion and joy, bringing some lesser known works to audiences, as well as finding more and more ease and comfort on the challenging recital stage. *I jump into the trousers of my first Octavian, a real trek up the Mount Everest of mezzo roles, and I want to bring a fierce, unbridled energy and freshness to this irresistible character, all enveloped in a real honesty and exuberance. *I tackle my first Ariodante in Geneva, and I want SO much for this role, it’s hard to put into words. I find that Handel is the most challenging and informing of composers, and it is such an incredible journey and JOY to sing his music – it will surely feel like ANOTHER hike up Mount Everest, which means I’ll be in great shape by the end of the year! It will be a tremendous amount of work, but I’m ready for it. *My first real, bonafide, legitimate, GENUINE vacation in…I don’t know how many years. It looks like it will be a safari somewhere exotic, but the final details need to be ironed out. I cannot WAIT to be thrust into an environment completely void of anything resembling a vocal score! I will work very hard in the time surrounding it, but I will work VERY hard at letting completely down to recover and regroup! It will be paradise! I wish each and every one of you every imaginable blessing for the coming New Year, full of health, contentment, peace and JOY, and I thank you for all of your support and enthusiasm over the past year!